Hopscotch is about many things, but one of the most important is discovery. Discovering new music is an obvious benefit, but it goes beyond that. Hopscotch makes a habit of bringing back older artists which allows for rediscovery of old favorites. It gives musicians the freedom and ability to craft performances that wouldn’t happen elsewhere so you can see your favorite artists from a new perspective. I encountered all of those facets of discovery on Friday night. New to me were Carlitta Durand, the compositions presented by New Music Raleigh, Luxe Posh and Mitski. Durand, an R&B artist from Durham, opened the night at the main stage in City Plaza. A 6 p.m. start time meant that the crowd was small. Durand’s enticing voice added a breathy layer over hushed grooves and funky bass lines. It was a nice change of pace from the rock and roll I consumed all afternoon at day parties and it made me think that Hopscotch needs more R&B in its lineup (or I needed to pay more attention and seek out the R&B that was available at the festival). New Music Raleigh joined the festival for the second year in a row and their performances of progressive and modern classical music are one of the most interesting additions the lineup. I was able to catch two songs, the most compelling of which was “Wind Tunnel,” composed by Patrick Higgins (who also plays bass in Zs, who played The Hive later that night). The piece is a solo for violin with the aid of a laptop which generated loops and echoes that turned one violin into a spontaneous aural assault from all directions. On the way up to Moore Square, I stopped by Neptune’s to meet some friends and found myself sticking around to dance to Luxe Posh’s subtle, but potent beats. Electronic dance music is one of the few genres I rarely indulge in during my yearly pilgrimages to Raleigh, but Posh’s set was so irresistible that l found myself reconsidering my own hesitation and bias. My favorite discovery of the festival was Mitski. Standing alone with her acoustic guitar on stage at Tir Na Nog, she seemed small in stature, but when she started to sing the typically noisy venue quieted. Her lyrics cut like Angel Olsen’s. “I want a love that falls as fast as a body from the balcony,” she sang during “Townie,” “I want to kiss like my heart is hitting the ground.” I hadn’t seen an intensity on stage like her’s since Scout Niblett mesmerized the Kennedy Theater at Hopscotch a few years back. TV on the Radio was this year’s old favorite to rediscover. Their last two albums, Seeds and Nine Types of Light, left little impression on me, but seeing Tunde Adebimpe on stage whipping his hands and body around I again reconsidered my previous conclusions. This is the band that recorded “Wolf Like Me” a song so thrilling I jumped up and down with excitement when they played it. A few minutes of total presence and I was willing to forgive and forget. The most exciting form of discovery is seeing current favorites in a new light. Nathan Golub has been one of my favorite local guitarists and pedal steel players because of his work with Wood Ear. He played acoustic guitar, not pedal steel, with some backing from drummer Brad Porter to a relaxed Kennedy Theater. The crowd sat on the floor and took in the fingerpicked notes. With a focus on letting notes hang in the air and bend, Golub’s songs are more laid back than his contemporaries, maybe a product of playing a lot of pedal steel and preferring longer phrases. 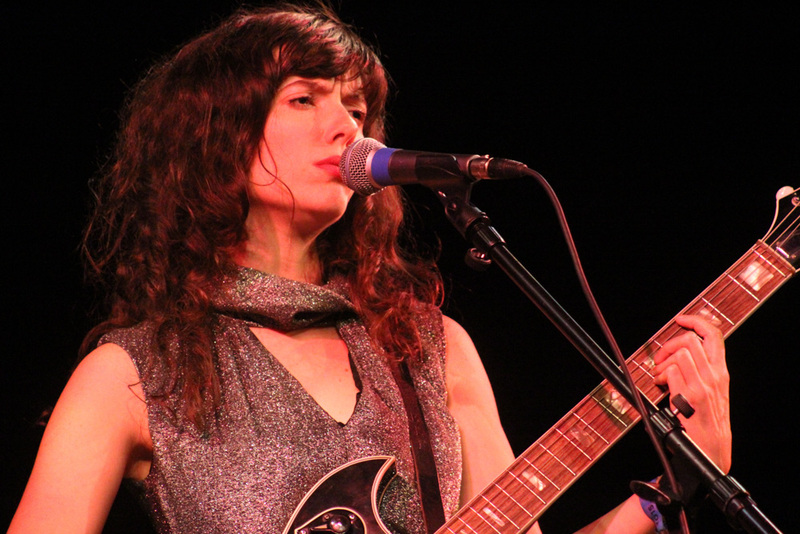 The highlight of the night was seeing Natalie Prass and the Spacebomb Orchestra in Fletcher Opera House. Prass revealed her strange sense of humor by having a comedian playing the character of an old, frumpy lady introduce her and then closing her set with a dance tribute to Space Jam that included backup dancers and basketball jerseys. In between, her lounge and broadway stylings hit their mark in the small theater, something that doesn’t come across as well in larger rock venues. In particular, her groovy cover of “Sound of Silence” felt like a special treat. Entranced by Prass, I stayed much longer than I intended to, failing to make it to my next planned stop. If there’s one reason to attend Hopscotch, it’s because it’s the kind of festival that will give you a new appreciation for music known and unknown and will leave your ears open a little wider than they were.